TrailCrossing at Lee Hill will be a unique collection of 31 single-family urban homes by Koelbel Urban Homes (KUH) in North Boulder, including three “permanently affordable” dwellings in accordance with the City of Boulder Affordable Housing program. Designed for active lifestyles, these state-of-the-art homes will embody what today’s savvy buyers want and expect: style, convenience and quality. Designed as a cozy conclave for easy living, TrailCrossing is the perfect complement to the surrounding community, where parks and other outdoor activities blend seamlessly with shopping, dining and entertainment. Unique shops, restaurants and the NoBo art district are just “around the corner,” while hiking and biking trails are right out your front door, along with an endless stream of cultural events in Boulder proper, just ten minutes away. It’s truly a dream location. For more information, including home details, floor plans, and a map of the site click here. Surround Architecture and Element Porperties have worked together in the residential construction of beautiful, modern three-story townhome units. The project, called Dwell 22, is built around a recently renovated, historic 1920’s era farmhouse. 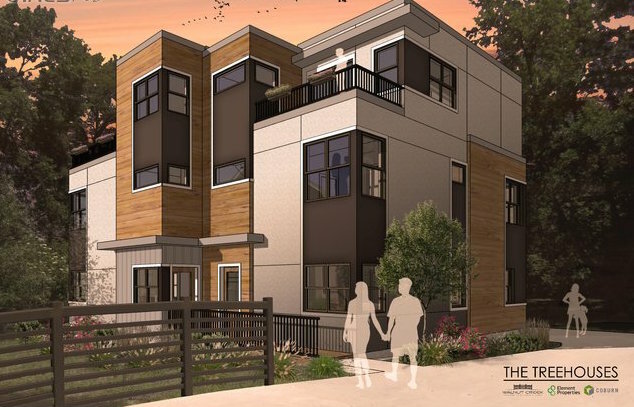 Located near Downtown on 22nd St, these townhomes will encompass all that Boulder values; the coalescence of old and new, aesthetic beauty, and energy conservation. Each home at Dwell 22 will be built in an efficient and environmentally friendly manner, and will feature high end, eco-friendly appliances. The townhomes have all been tested for HERS energy efficiency, in order to meet the current high sustainability standards. Not to mention, the radiant, in-floor heat, tankless hot water, and gas fireplaces will give you the utmost comfort and warmth during the winter. These modern, single-family homes will feature three bedrooms, and 2.5 bathrooms, as well as walkout balconies. Single-car garages and tandem parking spaces will also be provided. Listed with RE/MAX of Boulder. Newly planned residential construction by Element Properties of two three-story duplex units, totaling four units, on the principal and hidden portion of the Walnut Creek neighborhood. The Treehouses are located in a heavily wooded area next to the Boulder & White Rock Ditch that flows through the property. The newly constructed units will be the final phase of the Walnut Creek development and are expected to break ground in late April 2014 and delivered by Spring 2015. Tucked in the back lot an across the private bridge, this hidden gem feels worlds away from downtown, yet is only 2 blocks from Pearl St. 3 story homes with striking contemporary design, tons of outdoor spaces to enjoy the trees, deluxe master suite on its own level + 2 bedrooms on a separate level, attached garage, multiple decks and high end finishes. Listed with RE/MAX of Boulder. More information on the Treehouses here. Boulder Real Estate Gets Exciting! Moonbeam Boulder, LLC and Surround Architecture, the creators of the hottest Boulder Real Estate development in years; The Trailhead project, presented the plans, imagery and documentation of consideration to the City of Boulder Planning Board on November 1, 2012. After an extensive discussion between the neighbors, the creators, and the City members, the 5.84 acre, 23-home project was approved. We haven’t seen an opportunity to build this much Boulder prime Real Estate in ages. 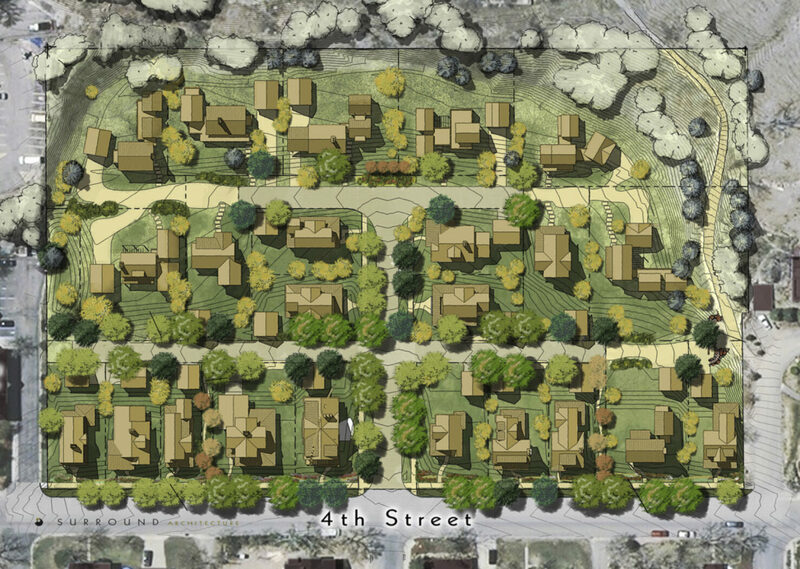 “Our vision was to create an exceptional example of an edge infill project, to be mindful of the significance of the site to the local community and neighborhood, and to offer a respectful and sensible development solution for what is one of larger residential zoned sites in the city of Boulder, Colorado. In essence, our work so far has been to illustrate and make real and feasible a sensitive extension of the urban fabric of Boulder.” said Nicholas Fiore, one of the project architects. We got a sneak peak on Thursday, October 3rd. The Trailhead Release Party, hosted by listing agents Julie Meko and John McElveen of Re/Max of Boulder, took place at the Kitchen Upstairs, in Boulder. All contributors attended, as well as interested buyers. With the help of Boulder’s signature tour bus Banjo Billy, a Boulder real estate-tailored tour to the new neighborhood, located on located at 2641 4th St. on the Western edge of central Boulder, was offered every 20 minutes to those eager to get a first glimpse of the completed project. For those of you who have been thinking about moving downtown, and have the means, this is your chance to create the ultimate Boulder Lifestyle; walking everywhere, a Mapleton Hill address, insane views of the Flatirons, Mt. 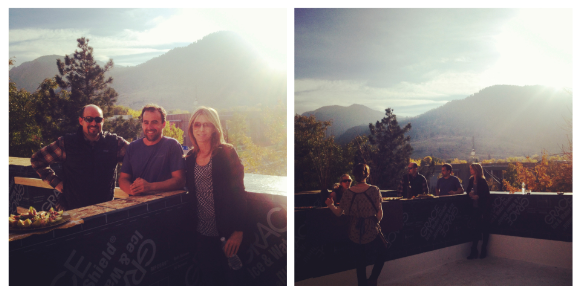 Sanitas in your back yard, Frasca Food & Wine a bike ride away…dreamy. Visit our blog, for more information on the Trailhead lots. Ever thought what it’d be like to live in a zero-energy home? Hard to imagine? Not for developers Ron Monahan and Terry Britton. In fact, not only did they imagine living in a zero-energy home, they made it possible for you to move in one, today. On the corner of Broadway and Poplar Avenue you will find Springleaf; A 1.75-acre project, designed by George Watt Architecture, that includes six custom townhomes and six single-family homes, each 3 bed/ 3 bath, ranging from 1,880 to 1,964 square feet. Also available and built only after pre-sale, are the only-in-Boulder vistas that begin at $850,000 and range from 3,319 to 3,368 square feet. The Springleaf team will match the buyer’s budget and green-lifestyle as buyers will be given the option to upgrade to a net-zero premium package including green point features such as geothermal heating and cooling systems. These townhomes couldn’t be located more conveniently, as they are within walking distance to public transportation, local supermarkets, restaurants, cafes and dry-cleaners as well as tennis courts, bike/hiking trails and Wonderland Lake. 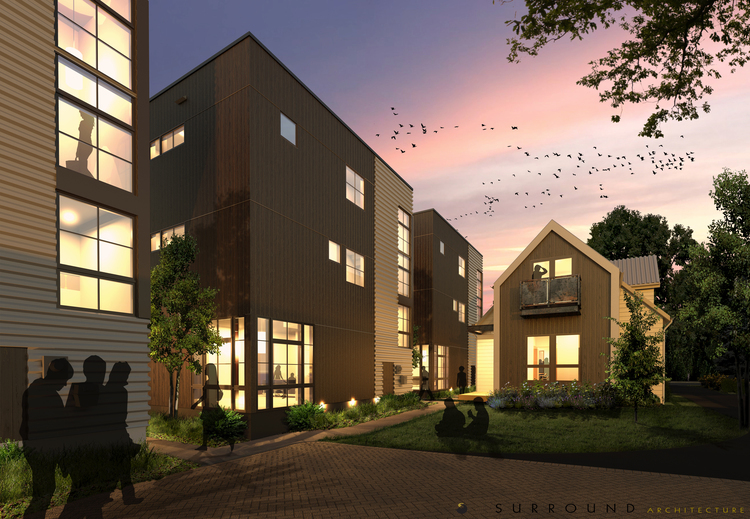 This impressive Northwest Bouldere eco-development is expected to earn LEED Platinum certification and perform at or very near net-zero energy. Springleaf; Boulder’s first high-efficiency green project has only a few properties currently available for sale, so if this is the kind of lifestyle you envision for yourself and your family you ought to make some quick moves. Stay tuned. 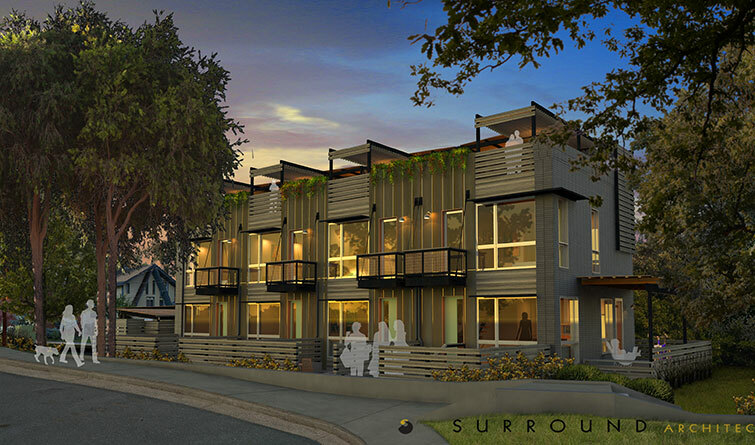 This is the beginning of a series of very cool Eco-friendly development projects in Boulder that you will want to be a part of. 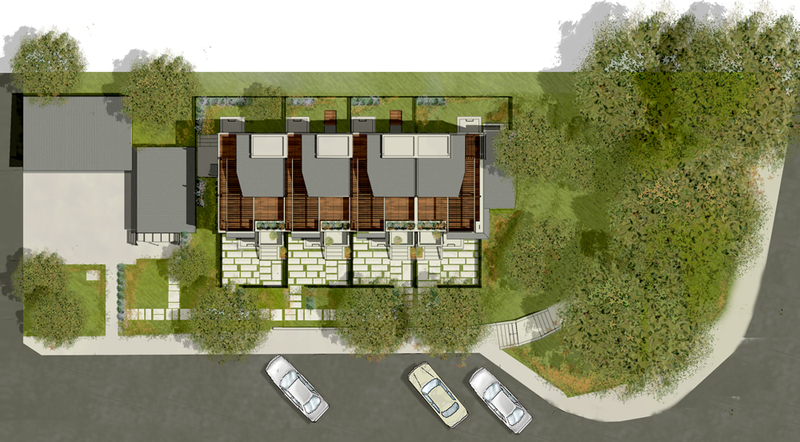 601 Canyon –a 4-unit townhome project that is under development in the desirable downtown Boulder area. Located on the corner of 6th Street and Canyon Boulevard, 601 Canyon is meant to provide a unique housing option for those who wish to experience all that Boulder’s downtown lifestyle has to offer. The downtown Boulder Real Estate project consists of 4 three-story units, with the option of one or two bedrooms per unit, plus a finished basement, covered private on-site parking and roof-top deck with unstoppable Flatirons views. The refined, contemporary yet traditional design intended for this project is portrayed in its timeless and welcoming feel. Attention to detail can be seen at every turn. Rustic steel accents highlight the entryway, while a bright and airy interior echoes the efficiency of the space. The black, Norman sized brick exterior promises an eye-catching, modern feel in the downtown neighborhood. Some additional features include a private balcony in each unit, landscaped front entry area with porch, rear landscaped private yard, and an open living space with modern kitchen and built-in dining island. The stairs in each unit hold floating treads made from reclaimed boxcar flooring, steel supports, and a glass railing. The second level contains a master bedroom suite with a walk-in closet, washer/dryer closet, and master bathroom with European-style shower and dual vanities. Contributors/ Creators: Built by Field West Construction, contracted by Element Properties, designed by Surround Architecture, Listed by Re/Max of Boulder, Inc. The Boulder Civic Are project years of planning and a over 5,000 collaborators, including community professionals, students of all ages, and seniors. “The goal of the project is to transform this area into Boulder’s social, civic, and environmental heart; one that prioritizes purpose per square foot over price per square foot.” (City of Boulder) For more information visit The City of Boulder Colorado.